An Ohio police chief was found dead in his home after he'd overdosed on opioids he had stolen from the department's evidence locker. 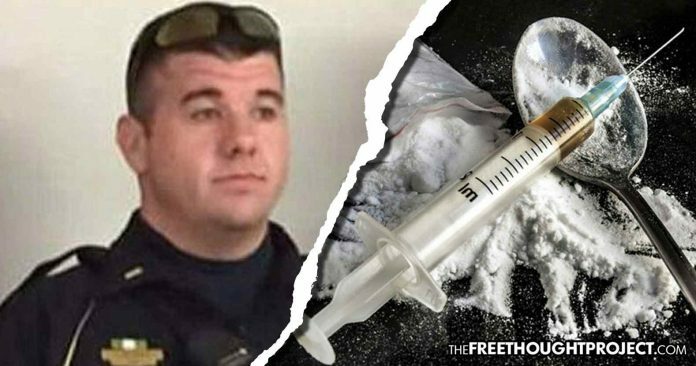 Kirkersville, OH — Illustrating just how large of a grip the opioid epidemic currently has on the United States, the police chief of an Ohio police department has overdosed on fentanyl that he stole from the department’s evidence locker. Kirkersville Police Chief James Hughes Jr., 35, was found unresponsive in the bathroom of his home earlier this year on May 25. After unsuccessful attempts at reviving him, Hughes was pronounced dead shortly after. Reynoldsburg Police Department Lt. Ron Wright, whose department is heading up the investigation into the case, told the Newark Advocate that the drugs Hughes was taking were evidence in other cases. “There was packaging that indicated that he was taking controlled substances from there,” he said, indicating that the chief had overdosed on drugs taken from the evidence locker. Hughes had just become the police chief in March and was only on the job a few months before he overdosed. Despite the mayor saying Hughes never had a complaint, the Advocate reports that Hughes’ checkered history was discovered by them following his hiring in Kirkersville. The mayor and village council members were reluctant or declined to answer any questions about that history, which included a misdemeanor conviction in Whitehall for disorderly conduct for a 2013 incident at a fast food restaurant drive-thru in which Hughes used a racial slur. According to police, they originally investigated who sold Hughes the drugs so they could charge that person. However, once they realized he’d stolen the drugs from the evidence locker himself, there was no one to charge in his death. Wright told the Advocate that he plans on handing over the case to state officials in the next few weeks. Wright implied that other officers in the department could’ve possibly had access to and taken things from the evidence locker as well. “There appeared to be some practices happening out there that probably someone from the state AG’s office should probably look into,” he said. Tragically, Hughes left behind a wife and three young children. After he overdosed a GoFundMe account was set up to help the family. This case illustrates no one is immune from the grips of the opioid crisis in America. Sadly, as tens of thousands continue to die every year, most people in government are attempting to solve the problem with force and violence instead of science and logic. As TFTP has reported at length, every day, more than 100 Americans die in the United States from opioid overdoses, and while this epidemic has become increasingly devastating in recent years, a natural plant that has been shown to combat opioid addiction is still deemed “illegal” by the federal government. According to research from the National Institute on Drug Abuse, as of March 2018, “more than 115 people in the United States die after overdosing on opioids.” These overdoses can be attributed to prescription pain medications, which are prescribed like candy with little warning about how dangerously addictive they are; heroin, which many addicts turn to when they lose access to prescription opioids; and fentanyl, which has become increasingly popular despite its deadly track record. The rise of the opioid epidemic at home has coincided with the United States’ control of poppy production worldwide. Before the U.S. invaded Afghanistan in 2001, there were around 189,000 heroin users in the United States. By 2016, that number had increased dramatically to 4.5 million users. The longest war in the nation’s history has resulted in the U.S. controlling 90 percent of the world’s opium supply. Additionally, the National Institute on Drug Abuse has stated that “Medical marijuana products may have a role in reducing the use of opioids needed to control pain.” Studies have also shown that deaths from opioids plummet in states where cannabis is legal and that 80 percent of cannabis users give up prescription pills. The federal government is also prolonging the opioid epidemic by pushing for a ban on kratom, a natural herb derived from the coffee plant that has served as a life-saving alternative for individuals who are addicted to opioids. Instead of acknowledging the success of kratom, the Food and Drug Administration is attempting to have it labeled as a Schedule I drug, which would mean that they claim it has no medicinal value. Unfortunately, tens of thousands more will likely die before any rational and scientific approach is brought forth by the state that will actually help to curb this epidemic. A police chief—who likely kidnapped and caged hundreds of people for substances deemed illegal by the state—has overdosed. But his death should not be in vain. Instead, it should serve as a wake up call to the rest of the drug warriors who think locking people in cages is the proper way to fix a health problem.